Let Platinum Pools create your dream gunite or vinyl inground swimming pool. Update your existing pool with our pool renovation & remodeling services. A custom feature can make your pool the perfect backyard retreat. 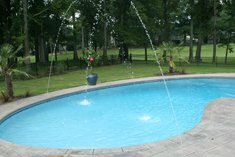 Welcome to Platinum Pools, one of Tennessee's finest pool construction companies. Serving not only Tennessee but also areas of Virginia and Kentucky, our 34 years in the pool construction business has allowed us to work with diverse client lifestyles in exotic settings. From infinity edge and natural free form to standard lap pools, we love to share in the dreams of our clients and make their visions come to life. Our certified licensed contractors and well-trained design team work closely with our clients from the start of the project to the very end, listening to what our clients want out of their pool not only in appearance but also in functionality. Building a pool or a spa can be somewhat of an intimidating project, but we at Platinum Pools make both speed and quality our top priority. We meet those deadlines, ensuring you have the pool you want when you want it. Our years of experience in pool design and construction along with our long standing relationships with some of the best manufacturers and distributors in the business allow us to build long lasting, world class pools that surpass the expectations of our clients. Best of all, when you choose Platinum Pools, you have chosen not only premium contractors, but made quality friends that truly care about client satisfaction. We've continued to assist hundreds of happy Platinum Pools customers over the years, whether it's answering a question about pool maintenance, doing a total backyard transformation, or adding a brand new water feature to create their perfect secret oasis. Contact us today to discover how we can make your backyard dreamscape a reality.